The Fujifilm XF 16-55mm f/2.8 R LM WR is a fast, professional-level standard zoom lens that delivers stellar results throughout the zoom range. It may be bigger, heavier and cost almost twice as much as the well-regarded Fujifilm XF 18-55mm f/2.8-4 R LM OIS kit lens, and also lack the optical image stabilisation of that lens, but for some users the faster constant maximum aperture, improved image quality, better build quality and weather-sealing may be more than enough to persuade them to upgrade. We feel that the Fujifilm XF 16-55mm f/2.8 R LM WR is also good enough to supplement or even replace a bag full of Fujifilm's excellent prime lenses - high praise indeed. The Fujifilm XF 16-55mm f/2.8 R LM WR proved to be remarkably sharp in the image centre almost throughout the entire focal range, except at full 55mm telephoto where optimum sharpness isn't achieved unless stopping down to f/4. Similarly edge sharpness is also commendably high, with the same exception of the 55mm focal length. The fast maximum aperture of f/2.8 at 18mm makes it very easy to creatively throw the background out of focus, with the nine-blade iris diaphragm achieving some lovely bokeh effects, and the combination of the f/2.8 aperture and 55mm focal length capable of blurring the background out entirely if you so wish. Vignetting is practically a non-issue, and chromatic aberrations are present but very well-controlled. There is some barreling at the 16mm wide-angle focal length, but no pincushion distortion of note at the 55mm setting. The lens' macro performance is rather unremarkable but its close-focus point of 30cm still comes in useful when including a foreground interest in the image, or for close up and personal shots. 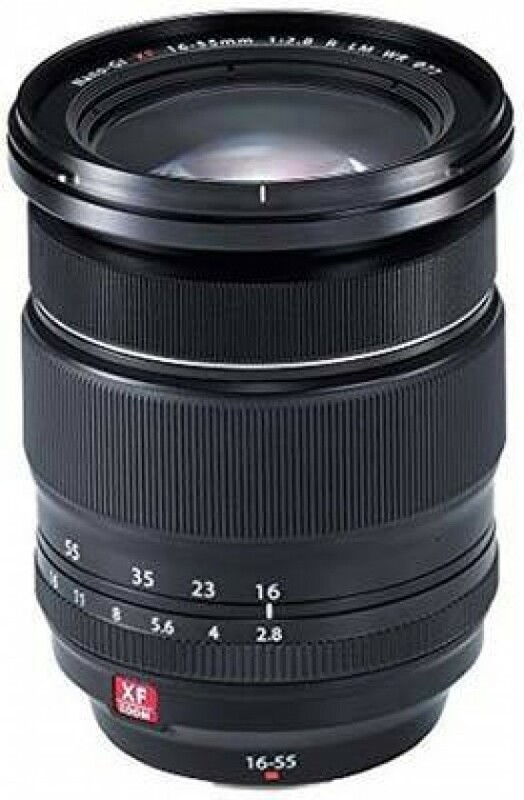 The Fujifilm XF 16-55mm f/2.8 R LM WR also features a fast, quiet and accurate auto-focus mechanism, and a marked aperture ring which makes it quick, easy and precise to set this key element of exposure. The lens mount is made of brass and the barrel of metal and, thanks to an internal focusing (IF) system, the front element and 77mm filter thread does not rotate on focus, which is very good news for those using polarisers and ND grads on a regular basis. The weather-sealing makes the XF 16-55mm f/2.8 R LM WR a perfect partner for the similarly weather-proof X-T1 body, as well as the 50-140mm telephoto lens - it's a shame that the 10-24mm wide-angle lens isn't also blessed with the "WR" designation. It may be big, lack OIS, have an eye-watering price-tag and face strong competition from Fujifilm's other standard zoom lens, but if you need the constant f/2.8 aperture, the versatility of a zoom and most of all the superlative image quality, then we can highly recommend the new Fujifilm XF 16-55mm f/2.8 R LM WR lens.